Due to similar morphologies, the taxonomy of East African Cynodon species has been a source of confusion. Before 1970, Cynodon aethiopicus, Cynodon nlemfuensis and Cynodon plectostachyus were referred to as Cynodon dactylon and Cynodon aethiopicus (Taliaferro et al., 2004). However, Bogdan, 1977 stated that larger forms of C. dactylon with a few whorls of racemes were actually C. plectostachyus and he recommended to consider references to C. plectostachyus older than 1970 as referring to C. aethiopicus. Giant star grass (Cynodon plectostachyus (K. Schum.) Pilger) is a robust, stoloniferous perennial grass with underground rhizomes. The stolons are thick, woody, with long internodes arching above the soil surface. They are fast-growing and form dense turf. The culms are robust, 30-90 cm high. The leaves are 10-30 cm long and 4-7 mm wide, soft and hairy. Giant star grass bears several racemes (7-20), 3-7 cm long, curling upwards at maturity. The spikelets are 2.5-3 mm long. The glumes are a conspicuous feature, as they are reduced to small triangular scales one-fifth the length of the spikelet (Taliaferro et al., 2004; Bogdan, 1977). Giant star grass is palatable to all classes of livestock (Bogdan, 1977). It is considered a valuable pasture for drier areas, but of low competitive vigour when mixed in swards with Cynodon nlemfuensis (Taliaferro et al., 2004). Cynodon plectostachyus is native of East Africa and is common, at an altitude of 800-2000 m, in Ethiopia, Tanzania, Kenya and Uganda along the Rift Valley (Bogdan, 1977). It is the most widespread grass in Mexico and Latin America (Yong-Angel et al., 2012). It is now naturalised throughout the tropics and sub-tropics (Bogdan, 1977). It grows in disturbed areas, in dry and light textured soils in grassland, cattle paddocks and roadsides (Cook et al., 2005; Bogdan, 1977). Giant star grass is a fast summer-growing grass. It can grow on a wide range of soils, from sandy loams to black cracking clay soils, and in areas where rainfall may be as low as 400 mm or as high as 4000 mm. However, it does better where rainfall is between 500 mm and 1500 mm (FAO, 2013; Cook et al., 2005). It is drought tolerant and can also withstand temporary flooding. It has good tolerance of salinity and alkaline soils. Cynodon plectostachyus grows better in full light and may survive some frost but low temperatures reduce DM yield (FAO, 2013). It competes well with other grasses and weeds due to its aggressive growth and rapid propagation (Pozo et al., 2000; Clayton et al., 1970). Cynodon plectostachyus is generally grazed, but it is also fed as hay. It has also been ensiled successfully (Esperance et al., 1985; Tuah et al., 1974). Cynodon plectostachyus is propagated by planting freshly harvested stem cuttings (1 cutting/m²) at the beginning of the rainy season on a firm seed bed (Taliaferro et al., 2004). DM yields range from 6 t/ha in unfertilized stands to 32 t/ha where fertilizer has been applied (Ecocrop, 2013; Lopez-Gonzalez et al., 2010). In the Northern hemisphere, yields are highest during the rainy season (June to October), decline during the dry season (February to May) and are lowest in winter (November to March) due to low temperatures and short photoperiods (Ludlow, 1985). N fertilizer, when applied, may range from 200 kg/ha/year to 800 kg/ha/year (Kawamoto, 2011). Giant star grass can be sown alone or in a silvopastoral system with Leucaena leucocephala and Prosopis juliflora, or with Eucalyptus (Baliscei et al., 2012; Mahecha et al., 2001). It has high tolerance of grazing and trampling by large herbivores, and heavy grazing was reported to improve its fitness (Yong-Angel et al., 2012; Georgiadis et al., 1988). High stocking rates (6-8 head/ha) are not detrimental to animal performance and improve sward production (Kawamoto, 2011; Georgiadis et al., 1988). Giant star grass can be cut in order to be fed fresh or to make hay. Cutting intervals of 40 days were shown to give higher DM yields than 20-day and 30-day rest periods. However, cutting every 20 days resulted in a higher protein content, higher feed intake and feed efficiency (Intong, 1998). Giant star grass cut and offered in association with Cenchrus ciliaris provided good quality hay for pen-fed dairy cows (Bwire et al., 2003). Giant star grass is used in Central and South America (Mexico, Colombia, Argentina) in silvopastoral systems where it is intercropped with Leucaena leucocephala (Nahed-Toral et al., 2010; Goldfarb et al., 1995; Mahecha et al., 2000). 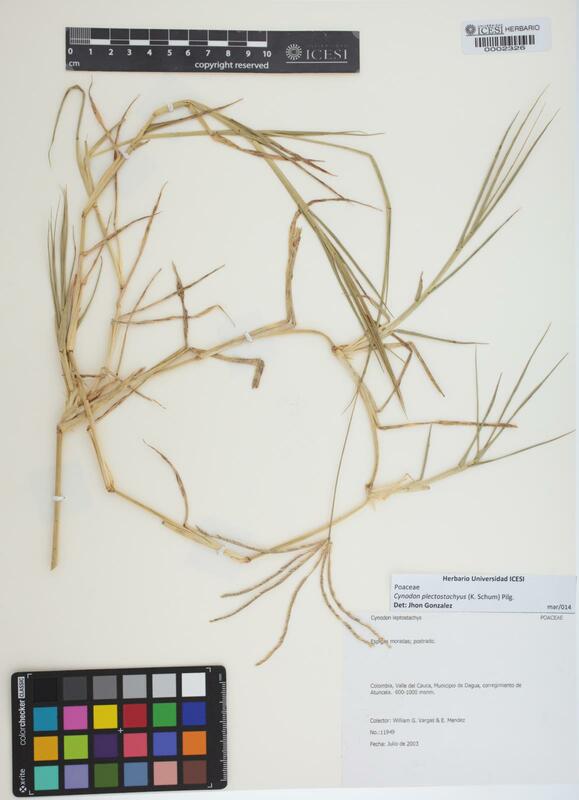 It is less suitable than Brachiaria brizantha in such systems (Ramos-Quirarte et al., 2009). Giant star grass was found to be more tolerant to saline conditions than king grass (Pennisetum purpureum × Pennisetum glaucum hybrid), Napier grass (Pennisetum purpureum), Guinea grass (Megathyrsus maximus) and golden millet (Setaria sphacelata) (Purbajanti et al., 2010). Giant star grass can be sown to protect soils against superficial erosion (Geissen et al., 2007). In Australia (Darling Downs, Queensland), it has been recommended in black clay soils and on the sandy soils of the coast (Skerman et al., 1990). In Mexico (Tabasco), giant star grass prevented superficial erosion though it was inefficient against sinkhole formation, because it could not alter groundwater properties as reforestation does (Geissen et al., 2007). Cynodon plectostachyus is a moderately nutritive grass, containing about 10% protein in the DM. Grass fed during the dry season can contain less than 6% protein while the CP of young grass can exceed 15% of the DM, and more than 18% when N fertilizer has been applied (Cecato et al., 2001). Cynodon plectostachyus is a cyanogenic species that can produce high levels of hydrogen cyanide when overstressed by defoliation, drought and heavy grazing/trampling. In Kenya, the death of several cattle of the same herd was attributed to their consumption of Cynodon plectostachyus defoliated by larvae of the Lepidoptera Spodoptera exempta (Georgiadis et al., 1988). Enlarged thyroids and stillborn lambs have been reported on sheep grazing on giant star grass, which could be the consequence of the presence of cyanide or of low iodine content in the grass (Eisler, 2007). Cynodon plectostachyus is a valued pasture in the tropics and it is part of cattle production systems in several dry tropical areas, particularly in Eastern Africa and in Central and South America. In the drylands of South-East Kenya, in a survey of cattle farmers, Cynodon plectostachyus was frequently the top-ranked pasture, above Eragrostis superba, Cenchrus ciliaris and Megathyrsus maximus (Ndathi et al., 2012). Cynodon plectostachyus is considered to be palatable (Bogdan, 1977; Asamoah et al., 1985), though less so than Guinea grass (Megathyrus maximus) and pangola grass (Digitaria eriantha) (Asamoah et al., 1985). Cynodon plectostachyus may have a similar, or lower, nutritional value than other grasses available at the same period in the same area. In Kenya, the in vitro DM digestibility (35%) of Cynodon plectostachyus hay was lower than that of Eragrostis superba (45%) and similar to that of Cenchrus ciliaris and Megathyrsus maximus (37 and 34% respectively) (Ndathi et al., 2012). In Puerto Rico, its in vivo DM digestibility (50%) was lower than that of Cynodon dactylon, Cynodon nlemfuensis, Digitaria eriantha and Megathyrsus maximus (54-55%) (Randel et al., 1989). In Brazil, the in vitro DM digestibility of Cynodon plectostachyus grass (63%) was found to be similar to that of Tifton 85 (a cultivar of Cynodon dactylon) and Cynodon nlemfuensis (63%), and slightly lower than that of Cynodon cultivars Coastcross and Tifton 44 (65%) (Cecato et al., 2001). In the Philippines, giant star grass cut every 20 days had a higher in vivo DM digestibility in sheep (60%) than when cut every 30 or 40 days (Intong, 1998). In Cuba, the in vivo OM digestibility in sheep of Cynodon plectostachyus silage was identical to that of Megathyrsus maximus silage (59%), and lower than that of King grass (Pennisetum purpureum × Pennisetum glaucum) silage (63%) (Esperance et al., 1985). Giant star grass does not have a high nutritive value, particularly during the dry season, and numerous trials have tried to determine the needs and methods for supplementing cattle and sheep grazing giant star grass. In Mexico (Colima), a traditional dual purpose cattle production system is based on maize stubble and giant star grass: this diet, though sufficient in energy, was found to be deficient in protein and dry matter, and required supplementation with other ingredients (Macedo et al., 2008). In silvopastoral systems, livestock grazing Cynodon plectostachyus had access to forage legumes such as Leucaena leucocephala or Prosopis juliflora (Nahed-Toral et al., 2010; Goldfarb et al., 1995; Mahecha et al., 2000). Supplementation of giant star grass with multinutrient blocks, and protein sources such as oil meals, animal by-products, urea and protein banks (forage legumes) is summarized in the table below. In Mexico, a comparison between steers grazing Cynodon plectostachyus and steers fed a maize-soybean meal concentrate showed significant differences in the fatty acid composition of the meat, which was richer in stearic acid (C18:0) for grazing steers (Montero-Lagunes et al., 2011). Literature reporting the use of Cynodon plectostachyus pastures for dairy production is scarce. In Cuba, Cynodon plectostachyus silage offered to Holstein x Zebu cows resulted in daily milk yields and DM intakes higher than those for king grass (Pennisetum purpureum x P. americanum) silage and lower than those for Guinea grass (Megathyrsus maximus) silage (milk yield 4.6 vs. 4.0 and 5.6 kg/d, respectively; DM intake 9.2 vs. 9.0 and 10.3 kg/d, respectively) (Esperance et al., 1985). In semi-arid areas of central Tanzania, combining Cenchrus ciliaris and Cynodon plectostachyus (50:50) provided good quality hay for milk production in dual purpose Mpwapwa cows and resulted in higher milk yield (5.3 kg/d) than other combinations of Cenchrus ciliaris, Megathyrsus maximus, Cynodon plectostachyus and Rottboellia exaltata (Bwire et al., 2003). Information about the use of giant star grass in rabbit nutrition is limited. In one study in Mauritius young giant star grass was safely used ad libitum to feed growing rabbits receiving a limited quantity of a concentrate. Digestibility of this forage, by rabbits, when harvested very young was high, particularly for crude protein and energy. Nevertheless, growth rate was significantly lower than for the control (complete rabbit pellets ad libitum), and DM intake was reduced by 35%. This indicated that giant star grass required supplementation with a specific concentrate to ensure adequate performance. It should be noted that the tested forage contained more than 20% DM protein which is atypical, as Cynodon plectostachyus is usually more mature, with a lower CP content, when fed to livestock (Ramchurn et al., 2000). Clayton, W. D.; Harlan, J. R., 1970. The genus Cynodon L.C. Rich in tropical Africa. Kew Bulletin, 24 (1): 185–189. Taliaferro, C. M.; Rouquette, F. M.; Mislevy, P., 2004. Bermudagrass and Stargrass. In: Moser (Ed.). Warm-season (C4) grasses. Agronomy Monograph N°45.